From cave men to today’s tech-savvy dude’s humans have constantly evolved from good to the best. Environmental factors and social needs are termed as the catalysts for such pragmatic change. But what makes each individual different from each other? Research classifies a person into smart, intimidating, argumentative, temperamental, sensitive, fearsome, fretful, adaptive, inquisitive etc based on his inner being and external presentation. But these traits are subjective to changes due to age, time and situation. Personality Tests for Jobs: Are They for Real? Personality assessment tests are devised by expert psychologists who have dwelled with human behavioral patterns for lifetime. Based on empirical data these test results are compiled. Going by the result shared by these, one cannot declare the exact state of a human mind and classify him as strong or weak. One has to understand that similar to Nostradamus or Linda Good Man books, these personality tests too state only generic results. These tests do not bring out the exact character sketch of a person but state only the outline that is not enough to decide his caliber. Recently there has been a survey that software giants like IBM and Oracle have spent a huge sum of money to hire personality development consultants who can act as life coach for their employees. They conduct personality test for the entire audience and based on the result of the test, they provide tips for the employees to win the battle of life. In one way, this helps the employees to shrug their negativities and turn a new leaf. On the other hand, to please seniors, customers and clients, the employee’s turn themselves into robots and try to hide their true feelings there by faking themselves to please others. Forcing someone to wear a mask of someone else may suit the corporate platform but in reality, it does not add any value to the individual as such. Assume, you are in a junction that separates into left and right turns. As the signal turns green, you try to turn left. But due to some repair work, you are forced to turn right and then take the next parallel road to reach our destination. This is the role of circumstance in your life. You being social animals may take many decisions based on the circumstance in contrast to our true self. During the assessment test, there are many environmental factors and circumstances due to which the person may exhibit a trait which is not his original quality. The test results do not consider these factors and hence may not mark the true personality. Many times when employment firms conduct personality tests to select their employees, they look blindfolded at the results and filter many able candidates. In such cases, the company should learn the social liability of the person before getting carried away by the results directly. The personality assessment questions are tricky in nature. They are multiple choice questions wherein at times all options seem reasonable and fit to the juncture. Each question always has a practical answer and emotional answer. Based on the option the candidate chooses, the personality trait is analyzed and result is discussed with the candidate. The result may influence the candidate in his future endeavors. A person who is kind hearted may start to behave ruthlessly when he is told his kindness will one day be a hindrance to his professional growth. Rather than learning from personal experiences, these test results invade the candidate’s mind easily and can alter his complete behavior towards anyone. A firm recruited a personality assessment officer to bring about a positive change in the environment. After a quarter, when the CEO checked the results, he was amazed to see the numbers. Each employee worked hard and strived to achieve more than he could. Surprised the CEO decided to visit the work floor and congratulate the newly hired consultant. To his amazement, the office floor was not chirpy and charming as usual. When he stalked his employees to learn the reason, he was shocked. Personality assessment tests and its after effects had caused this change. People who used to friends with each other, have turned competitors trying to prove their strengths and hide their weaknesses. Among equals when one is appreciated for his leadership strengths, indirectly this Increases employee animosity and this is not a healthy environment for one to work and learn. Personality assessment tests create an emotional discrimination among people. Leaders try to move with fellow leaders. Introverts prefer the company of introverts and same for extroverts. When the whole world is fighting racial discrimination, such techniques bring an emotional divide among peers. When a company conducts personality tests on its employees, many trust issues crop up. The trust between the employer and employee, the bond between fellow employees etc. gets affected. People in the quest for emerging strong and victorious run behind success and forget basic virtues like compassion, friendship, trust and love. As such due to these trust factors, these tests finally turn in vain. The cost involved in these tests is high. Hiring experts, getting them assess individuals incurs a lot of expenditure in terms of time, cost and human resource. Also, these tests should be conducted periodically and hence the process involves a lot of financial and resource planning when initiated. These personality tests are devised to analyze people based on their past and present. The results tell the current attitude and nature of a person and give no morale boost for the future. A person has to be smart enough to connect the dots and learn how his attitude will frame his future and thus adapt to the situation. Anyone can undergo personality assessment tests. But not all have the ability to hear all the feedback about themselves and their actions. For closed people who are not receptive to feedbacks, these tests can be waste of time, money and effort. Hence those who are ready to fight against their weakness and add them to their list of strengths should only attempt these tests. A single follow-up test will not reflect the changes in your personality but a series of tests will do. Hence these works only for those people who have the patience and perseverance to self- motivate themselves and evolve into a better human being. These are some reasons why personality tests may not work with all kinds of people. However, there are few recommendations that these personality tests can incorporate within themselves to make it work and help people who attempt these assessments. Utopian questions that hold no relevance to current generation must be eliminated from the question bank. Instead of more situations relating to current world habituation must be added in the list. This will help the candidate to relate to the situation and answer them easily. People nowadays do not express anger and aghast openly. When the answer options are framed like “I Disagree”, “I strongly disagree”, the candidate may fake his answer to a more neutral option like “sometimes” and fake their true nature. Hence to combat such issues, the answer options must be more optimistic and flowery in nature. Some people can express with words rather than choose an option. Hence instead of getting carried by the multiple choice answer and gauging their personality, one must be provided with an option to write the rationale for their answers. This helps the expert to understand the candidate’s state of mind while answering the question. A single instance cannot judge the individual’s character. 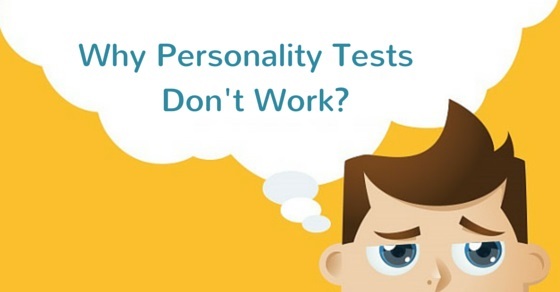 Most of the personality tests do not work because they are attempted once and no further follow-up is planned to check the individual’s progress. Hence these tests to be repeated at constant time intervals to check the improvement in the behaviour of a person. Most of the assessment tests are written. Instead of written tests, a one to one session with the candidate gives ample scope for the expert to understand the behavioral trait. Eye contact, body language and answers to each of the question together help in understanding one’s personality in general. Personality tests are conducted for individuals and not for roles. Hence there should not be any demarcation based on the role they play at the workplace during an assessment. Such righteous tests help to achieve equality among all employees in a firm. Also, this gives ample opportunity for people who were considered underdogs to rise and shine among peers. Personality tests are a boon when the assessment is performed unbiased. Effort spent on personality assessment goes futile if the candidate does not trust the results. Hence meticulous planning, careful question selection and rationale for each classification are aiding factors that will make such tests worthwhile.